Don’t you have some dishes that you love to eat and rarely cook? Risotto is one of them for me. It’s really easy, just requires a bit of a commitment and you have a delicious dinner. When I came upon an incredible bunch of chanterelles at the farm recently, I knew immediately what they were destined for. In a medium saucepan, add the chicken broth and the reserved strained porcini soaking liquid and cook over medium heat. When the broth starts to simmer lower the heat and keep in on a slow simmer. In a medium, heavy-gauge saucepan over medium-high heat, melt 2 tablespoons of the butter. Stir in the rice, toasting just until it starts to sizzle and pop, about 1 minute. It should not color. Stir the porcini, the wild mushrooms and the wine into the rice. When almost all the liquid has disappeared, after about 2 minutes, add just enough hot broth to cover the rice. Lower the heat to maintain a vigorous simmer; stir occasionally. When the broth is almost gone, add enough to cover the rice, along with a pinch of salt. Check on the risotto every 3 or 4 minutes, giving it an occasional stir to make sure it isn’t sticking to the bottom of the pan and adding just enough broth to cover the rice when the liquid has almost disappeared. Continue this way until the rice is just al dente, about 20 minutes total cooking time. Bite into a grain; you should see a white pin-dot in the center. Take the risotto off the heat. Add the remaining butter and stir vigorously for a few seconds. Add the parsley, cheese and more salt, if needed. 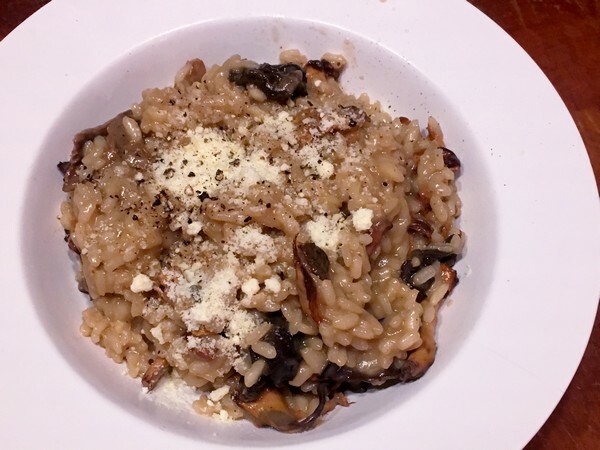 The risotto should be moist and creamy, not runny. Stir in more broth to loosen the risotto, if you like. Serve immediately and enjoy! My verdict: Great! Need to make risotto more often. I was lucky to have good rice, homemade chicken broth, fresh and dried mushrooms. I like this recipe because the addition of the soaking water for the mushrooms gives it a great depth of flavor. Just make sure to strain it before using it as sometimes dried mushrooms can be gritty. 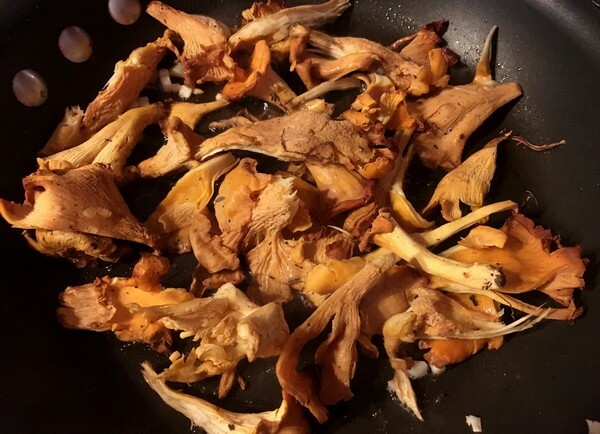 I was worried that the chanterelles wouldn’t last, so I sautéed them in butter with a little garlic and salt. Because they were pre-cooked, I waited until the rice had been cooking for about 15 minutes before adding them in. They were delicious! 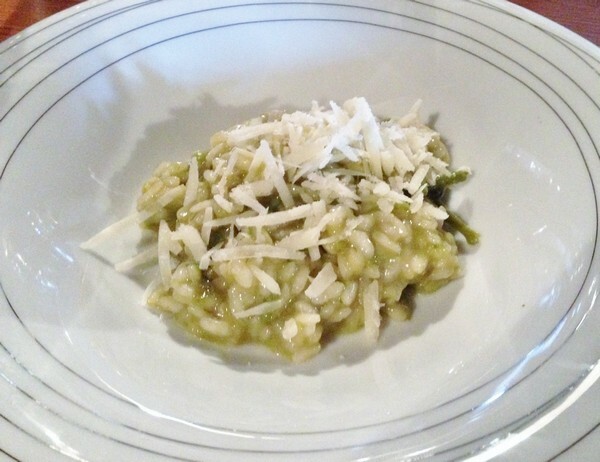 So, pull out some arborio rice, and a chair and make yourself some risotto. 30 minutes later you’ll be happy. Sometimes something simple makes you step back and focus. 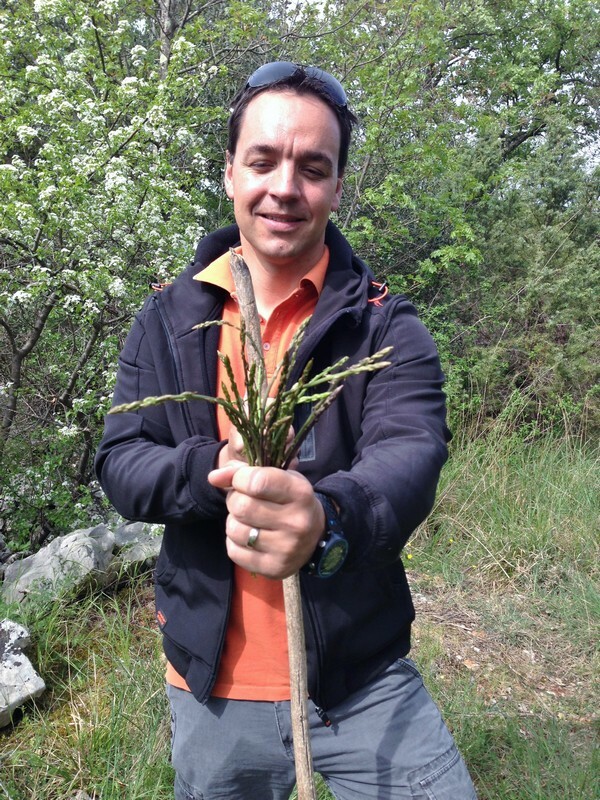 For the Accidental Locavore, it was hunting wild asparagus in Istria. 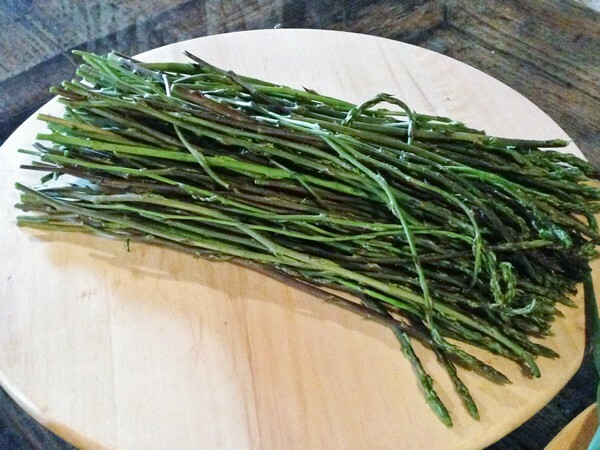 There, wild asparagus are everywhere, but if you’re not looking you can easily walk past acres of them. 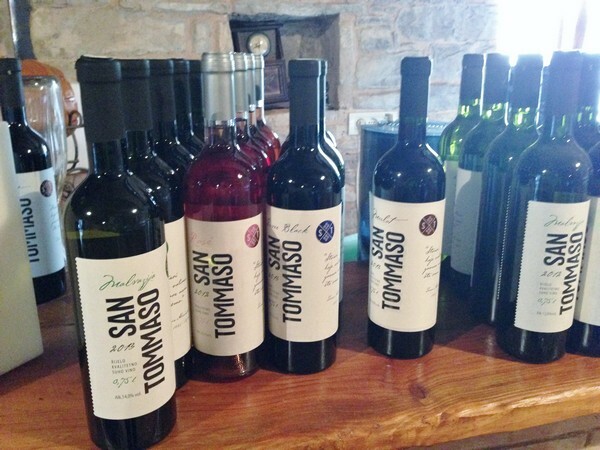 Our hunt started in Golaš, by the winery San Tommaso. We got a briefing from Goran and Janja on how to pick them (snap off from just above the ground) and learned that the harpoon-like tool he picked up wasn’t for asparagus, but snakes – never a good sign! 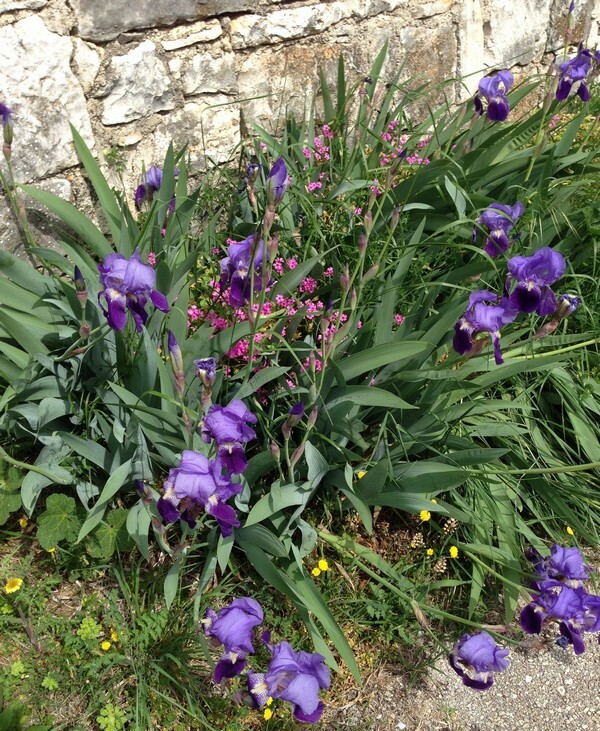 Wandering out towards the woods, we passed by beautiful clumps of iris, growing wild by old stone walls. 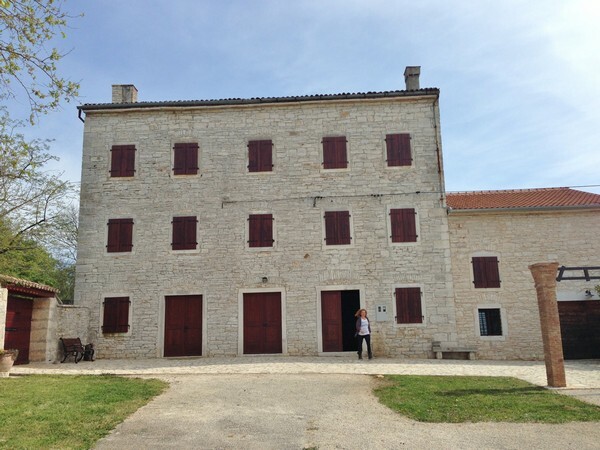 Further out in the countryside, Goran showed us what to look for. Usually there are feathery clumps of greenery, like its cultivated cousin. Then you have to really focus in and look for the elusive spears. 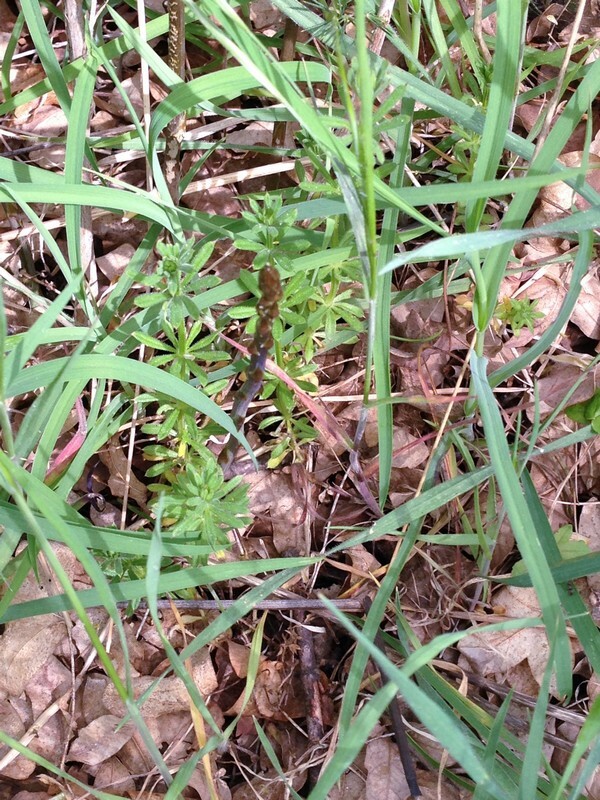 In the wild, asparagus is well camouflaged. It blends in and looks like grass. I don’t think I ever found a green spear, just purple ones because they stood out a little from the rest. Goran and Janja just cruised along stopping every couple of feet to pick a stalk or two. After a while, when you’ve really begun to focus in, it does become easier and then you start to see them everywhere. Luckily, the same could not be said for snakes! When we had a nice bunch we headed back to the winery to prepare them. Once rinsed, Janja told us to snap off the tips and the next section (about an inch or two). That made a nice bowlful that was split between two dishes. Sneaking a nibble, I noticed that they were much more bitter than the larger, cultivated ones we get, but still tasting like asparagus. First up: scrambled eggs with wild asparagus, bacon and Parmesan. The asparagus was cooked in the fat from the bacon and set aside. Once the (dozen) farm-fresh eggs were scrambled the bacon and asparagus were added back in and topped with cheese. Paired with a Malvazija, it was a well-deserved and delicious dish! 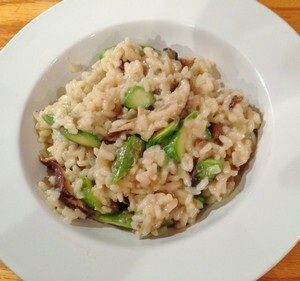 Next up: risotto with wild asparagus. This time, onions were sautéed in local olive oil and the rice added. Much stirring and twenty minutes later, the asparagus went in and a sprinkle of Parmesan finished off the dish. The rice was perfectly al dente and the asparagus gave a nice, slightly bitter bite to the dish that was offset by the cheese. A Terran, the local red grape, was the perfect accompaniment. We don’t often get to forage for our food and thankfully we don’t need to. However, sometimes it’s good to put aside the big city malaise of going, going, going and take time and regard the surroundings. Who knows what you’ll find? 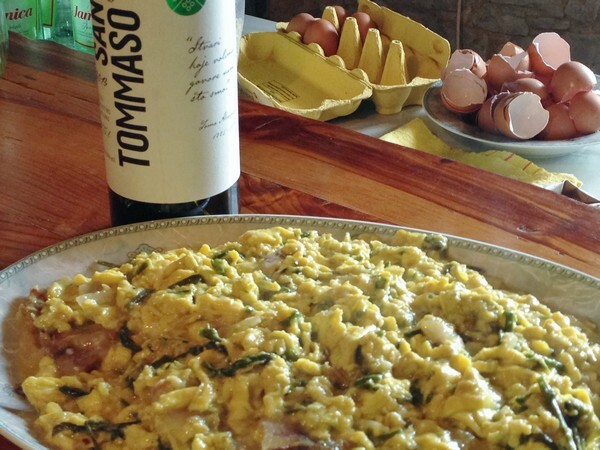 If you’re interested, San Tommaso does tours and other lunches when asparagus aren’t in season. 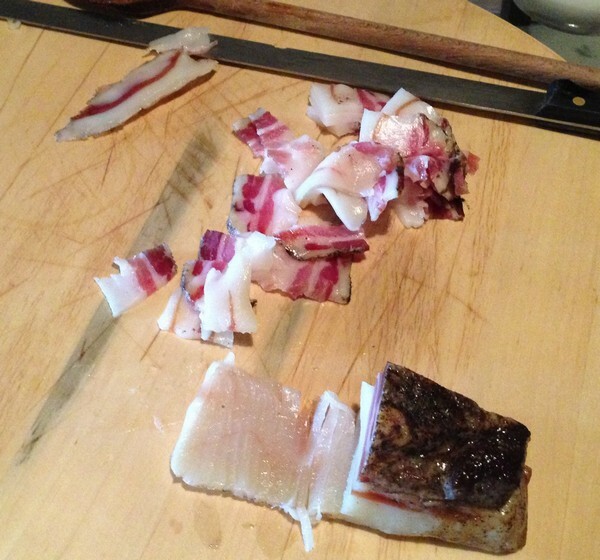 Pasta with truffles and charcuterie are some of the other choices. They’re flexible and Janja will work with you to make it memorable (but the asparagus are a really good reason to go in the spring!). The Accidental Locavore bought a beautiful bunch of wild mushrooms and some nice fat asparagus at the Rhinebeck Farmers’ Market recently. What better way to show them off than in a beautiful risotto? We also had some mixed dried mushrooms, so they got added to the mix. What’s good about using the dried ones too is that you can use the soaking liquid as part of the broth for the risotto (just be sure to strain it first – a coffee filter will work fine for that). This easily fed 4. 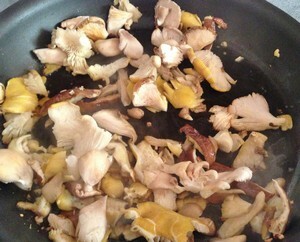 Soak the dried mushrooms in very hot water for about 20 minutes until they are pliable. Remove the mushrooms from the liquid and strain the liquid through a fine strainer or a coffee filter. Set the liquid aside. Add about 2 tablespoons olive oil to a large sauté pan, over medium-high heat. Add the garlic and cook until they turn golden. Remove the garlic from the pan. Add all the mushrooms and the asparagus and season with salt. Saute until the mushrooms are pliable. Remove from the pan and set aside. Add another 2 tablespoons olive oil to the pan. Add the onions and season with salt and pepper. Stirring frequently, cook until they are soft and translucent but are not browning. Add the rice and stir to coat with the oil. Cook for 2-3 minutes, stirring frequently, to toast the rice. 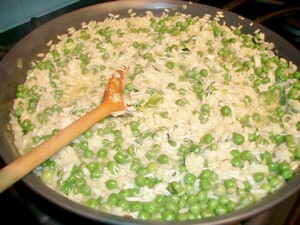 Add the wine, and stir frequently until it has all been absorbed by the rice. 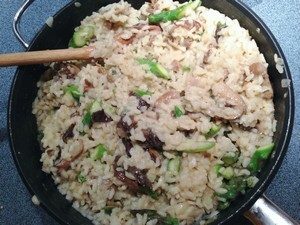 Add enough of the liquid from the mushrooms to cover the rice and stir until that has been absorbed. Add any remaining mushroom liquid and enough of the chicken stock to cover the surface of the rice. Keep stirring until that is absorbed. Keep adding the stock to cover the rice and stir until it’s absorbed. Depending on your rice, this may be 2 or 3 more times. When you think you’re about to add the last addition of stock, add the mushrooms and asparagus into the pan. When the rice is cooked to “al dente”, remove from the heat and add the butter and cheese. Stir well. The rice should be very creamy. Serve and enjoy! In a medium pot, bring the stock and wine to a boil, lower to a simmer. In the largest sauté pan you have, or a Dutch oven (it’s easier if you have a large shallow surface), heat the butter over medium-high heat. Add the onion, lower the heat to medium and cook until the onion is tender, but not browned, stirring occasionally, about 7 minutes. Add the garlic and cook for 2 minutes. Add the rice, stirring to coat well, about 1 minute. Add about 1 cup of the hot stock and stir gently until most of the liquid is absorbed. Add another cup of the broth, still stirring, until that’s absorbed. Continue, one cup at a time until you’ve used 3 cups of stock. When that’s absorbed, add the saffron, peas, scallions, and about 1 ½ cups of the broth. Continue to cook, always stirring, until the liquid has been absorbed. Taste the rice. If it’s still hard, add more stock or water and cook until it’s almost tender (al dente, anyone?). Add the rest of the butter, crab meat, mint, lemon zest, salt and pepper, Parmesan and 1 cup liquid. Cook, stirring, until the crab meat is heated through, the liquid is mostly absorbed and the rice is plump and just slightly chewy. Garnish with the mint leaves, serve and enjoy! The original recipe calls for 3 cups of peas which is what I used. I thought there were too many and they overpowered the rice and crab. However, since they were the last of what I had shucked and frozen from the spring, we agreed to live in harmony. The crab was lovely and subtle, the mint and lemon zest added a nice light touch. The next time I make this, the Locavore might replace the peas with frozen artichoke hearts. What do you think? He thought the rice was well cooked, but thought there were too many peas (and this from a pea fan) and too much crab meat.